1In a small bowl mix sugar, yeast and warm water, let it stand for about 10 minutes. 2In a large bowl mix flour and before prepared yeast, stir well. 3Add table salt, extra virgin olive oil and stir again to form a dough. 4Put the dough on a lightly floured surface and knead for about five minutes. When the dough is firm enough and it no longer sticks to your hands, lift it up and throw it hard against the work surface, that will help to develop gluten, so the dough will be easy to stretch. 5Put the dough in a lightly floured bowl, cover it and let it sit until doubled in volume. 6Preheat the oven on 230 degrees C (446 degrees F). 7When the dough is ready, put it again on the lightly floured surface and knead for 2 -3 minutes. Flat the dough on the lightly oiled baking sheet. 8Brush it with extra virgin olive oil, then sprinkle with coarse salt and rosemary leaves. 9Bake for about 20 minutes. This recipe is for a 30 cm in diameter focaccia. 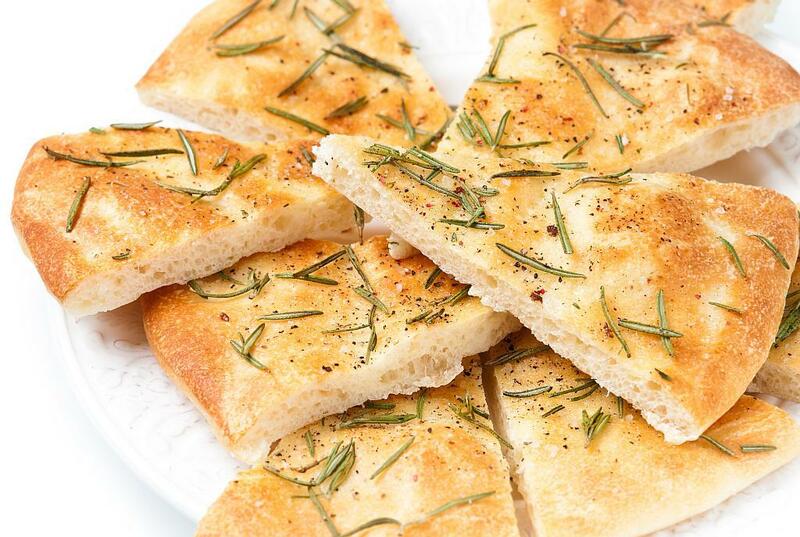 Focaccia is a recipe that is very easy to adapt. If you like you can add some rosemary when kneading the dough. Focaccia needs to be around 1 cm thick.